16 extremely efficient high-output lamps. 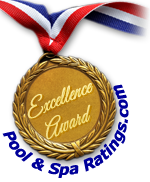 2-year powertrain extended warranty on electric components ensures your tanning bed will stand the test of time. Extra-long Extra-wide tanning surface 78" x 34"
Featuring 36 Wolff High Output Lamps. Approximate Tan Time: 20 minutes. With the largest tanning surface of any commercial tanning bed on the market today and a total of 36 extremely efficient high-output lamps, the Solar Storm 36ST Stand-Up Tanning Bed offers you a tanning bed salon quality tan right in your own home. 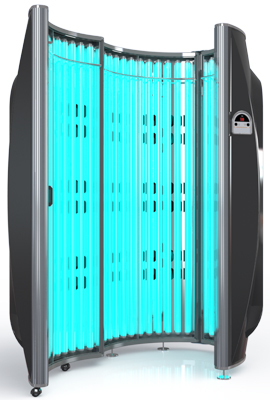 The Solar Storm 36ST Stand-Up Tanning Bed�s top-of-the-line features and unique custom design might make you think that it must cost a fortune. But, because we sell our tanning beds directly from our factory right here in the USA, we are able offer prices that are significantly lower than our competitors� prices. Featuring 48 160 Watt Wolff High Output Lamps. With the largest tanning surface of any commercial tanning bed on the market today and a total of 48 extremely efficient high-output lamps, the Solar Storm 48ST Stand-Up Tanning Bed offers you a tanning bed salon quality tan right in your own home. The Solar Storm 48ST Stand-Up Tanning Bed�s top-of-the-line features and unique custom design might make you think that it must cost a fortune. But, because we sell our tanning beds directly from our factory right here in the USA, we are able offer prices that are significantly lower than our competitors� prices. for refinements that improve the quality, appearance and performance of the product.